Just before Thanksgiving in 2013 (which was, in a fit of calendrical oddities, also the start of Hanukkah in 5774), we took in a Final Refuge dog from Old Dog Haven. We lost Grace to cancer in September. She had a rough life for a long time, but she had a good three years at the end. 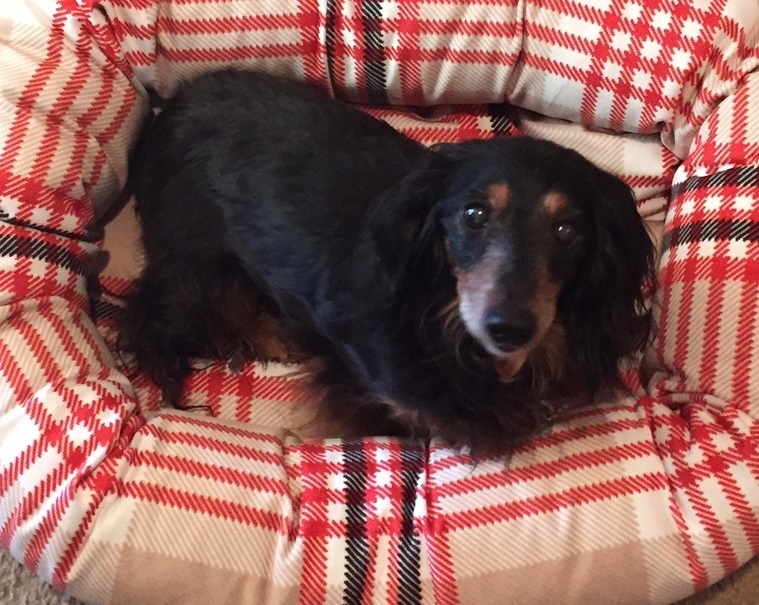 This afternoon, Old Dog Haven posted a plea for another Dachshund in need of a home. So, for Hanukkah 5777, tomorrow morning we’re off to the shelter again. Old Dog Haven exists to ensure that dogs do not end their lives in shelters for the crime of being old. There is no shelter, the dogs are all in family homes, and almost all of the dogs in care (more than 300 at last count) are, like the dogs in this post, considered Final Refuge Dogs. They will not be adopted out, they are instead placed in permanent homes, and Old Dog Haven pays the veterinary bills for them for the rest of their lives. Old Dog Haven was recently featured on The Today Show. I was surprised to see that I had never migrated this over from my old web site. In 1997, we were living in rural Central Virginia, just outside of Charlottesville, and I had not been able to find any place that had a decent Hot and Sour Soup. So I scoured the Internet for some ideas, and then spent the weekend mixing and matching and tweaking until I ended up with exactly what I wanted. A complex sour soup, with a slow building relatively mild heat. Set the cloud ears in luke warm water for 30 minutes to rehydrate. If you are using Lotus Buds, rehydrate them with the cloud ears. Once they have rehydrated, slice them (I find it easiest to hold them in a bunch, and then just slice across the mushrooms) if they are too large to eat comfortably. Slice the tofu (half an inch wide and high, and the length being half the width of the Tofu block works well), and combine the tofu, cloud ears, bamboo shoots, and the lotus buds or meat if you are using them, and put them aside in a bowl. You may find you have a little too much, if you do just set it aside for another batch or another recipe, and make a little less the next time. This is the place to experiment, all sorts of vegetables or meats could be added here. In a bowl or liquid measure, combine all of the seasoning ingredients, and stir well. These are the most important ingredients, they are what give the soup its flavor. Do not substitute. Bring the chicken stock to a boil over high heat, in a pan capable of holding about three times the volume of the chicken stock. Once the stock reaches a boil, add the bowl of chopped vegetables and meats, and again, let the soup come to a boil. You want to leave room for the seasonings and the garnish, so don’t overfill your pan. Once the soup again starts to boil, add in the seasonings (being sure to stir first, so that the corn starch doesn’t clump). While the soup again moves towards a boil, beat the egg in the same container you had the seasonings in (to get that last bit of flavor stuck to the sides) and mix in the green onions if you are using them. When the soup again reaches a boil, slowly spoon in the egg mixture. Turn the heat down to simmer, and serve. This is a rub primarily for brisket. How to cook a brisket is beyond the scope of this post, but this is the rub I use. In a clean coffee mill or spice grinder coarsely blend all the ingredients except the salt. Combine all ingredients (including the ground spices), and mix well. Store in a sealed container. This is a rub primarily for chicken. It is decent for pork, and adequate for beef, but it really shines for chicken. Because it includes sugar, make sure you cook the chicken with indirect heat. In a clean coffee mill or spice grinder blend the Peppercorns, Mace, and Grains of Paradise. Combine all ingredients (including the ground spices), and mix well. Store in a sealed container.